Flag football has often been suggested as a safer alternative to tackle football, but is it actually safer? Too soon to tell, say researchers from the University of Iowa. Presenting their preliminary results to the American Academy of Pediatrics at its National Conference and Exhibition in Washington, D.C. the weekend of October 23 to 27, 2015, the researchers found that injuries were more common in flag football than tackle football and occurred at a higher rate than in a youth football league, but players in flag had a lower risk of injury, and a lower risk of serious injury, with the proability of injury to tackle football players in the league, which covered grades 1 through 6, about twice that of flag football players. 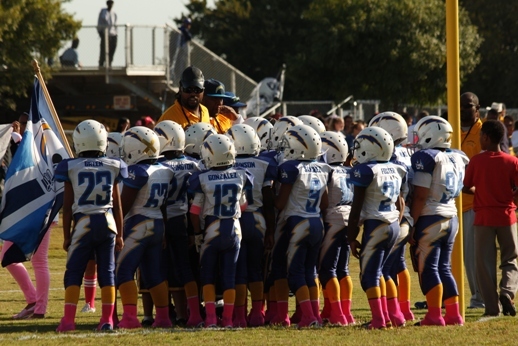 To determine the rates and types of injury in youth flag and tackle football, researchers partnered with two large youth tackle football leagues and one smaller flag football league, all of which had mandatory attendance and injury tracking policies. The researchers created an online infrastructure for the leagues that allowed them to extract de-identified attendance and injury data. Injury rates were calculated from reported exposures (any game or practice) and injury reports. Injury type was determined from the injury reports. Only injuries that resulted in lost playing time were included. Concussions, fractures, ligament tears and injuries resulting in 7 or more days of time loss were classified as serious. Tackle and flag injury rates were then compared. The three leagues generated a total of 46,416 exposures and 128 injuries were reported (2.75 per 1000 exposures). Injuries were actually more common in the flag league compared to the tackle leagues: The ratio of injuries from tackle / flag was .4511, with 0.7 concussions and 1.2 total serious injuries per 1,000 exposures in the tackle leagues. There were 1.3 concussions per 1,000 exposures, but no other serious injuries in flag football. While the flag league reported a higher rate of total injuries, players had a lower estimated probability of being severely injured in the flag league. The estimated probability of severe injury in flag league non-linemen was .231 compared to tackle league non-lineman (.539). The flag league had no linemen while the estimated probability of severe injury in tackle league lineman was .541. The Iowa researchers concluded from the data that injuries are relatively common in youth football, and that the injury rates in the tackle leagues were similar to reported rates in high school football. They were unable, however, to demonstrate that flag football was a safer alternative to tackle football, and said further large-scale studies would be needed before a determination about the relative safety of flag and tackle football could be made.